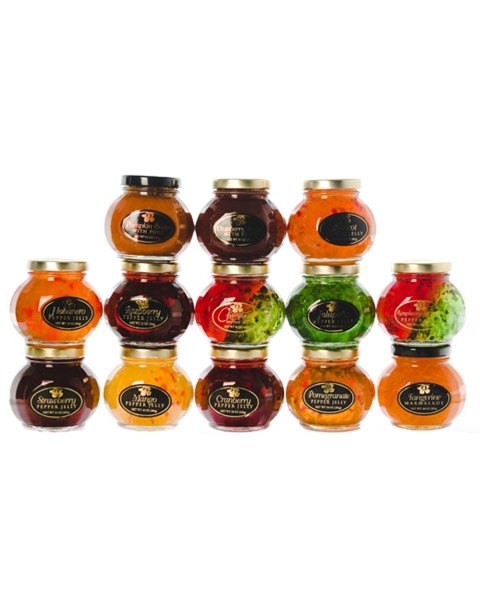 An assortment of delicious pepper jellies; Apricot, Cranberry, Habañero, Jalapeno, Mango, Pomegranate, and Tangerine. Cranberry/Jalapeno Pepper Jelly is beautifully divided with Cranberry on one side and Jalapeño on the other. Christmas Jelly - Jalapeno/Cranberry is now available year round!